Friday, March 11, 2011 will forever be remembered by citizens of Japan and the world as one of the most powerful earthquake in Japan, the fourth in the world, with a magnitude of 9.0, strikes northeast coast of Honshu at 05:46AM UTC. 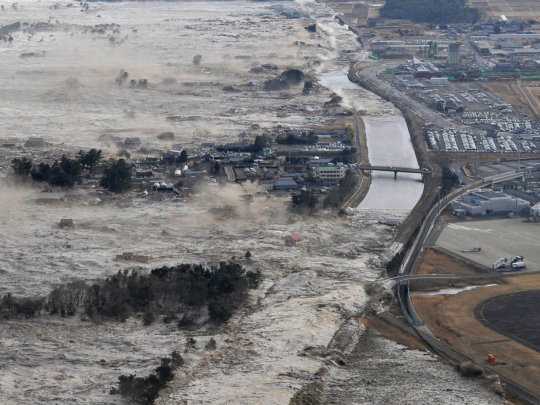 The catastrophe not only damaged most cities in Japan, but also triggered a 7 meter (23 foot) tsunami that swept over farmlands and towns, 10 km (6 miles) far inland. Within 10 minutes after the quake, 52 countries and islands in the Pacific Ocean region received their tsunami alert from Pacific Tsunami Warning Center, as videos and images of the devastating earthquake and tsunami made their headlines on the Net. Screen grabs of sequence pictures of an explosion at the nuclear power station in Fukushima, Japan, yesterday. — AFP picture. Japan’s first-ever states of emergency was declared after five nuclear reactors at two power plants in Fukushima Prefecture lost their cooling ability in the aftermath of the earthquake. This is also the first time that such a grave nuclear threat has been raised in the world since a nuclear power plant in Chernobyl, Ukraine exploded in 1986. To date, the official death toll is reported at 2,500, however more than 10,000 are still unaccounted for and presumably dead as search and rescue efforts continues for the 4th day after the catastrophe. Watch satellite’s photos of Japan – before and after tsunami impact. CBS News Gallery – Quake, tsunami slam Japan. 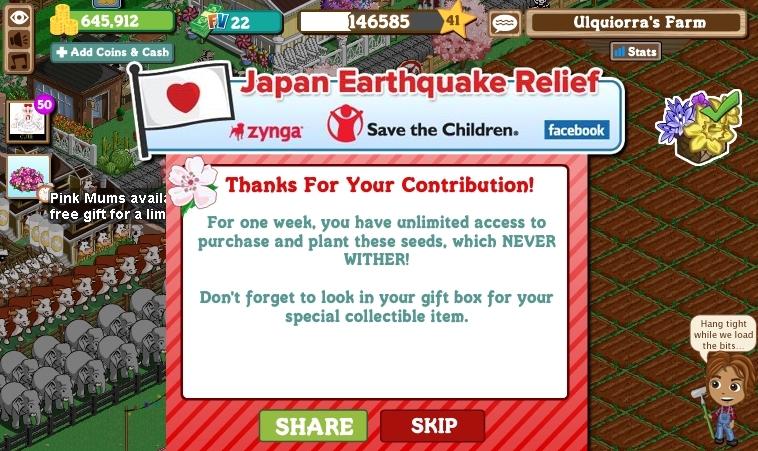 Save The Children and Zynga has team up to help Japan Disaster Relief Efforts, where players have the opportunity to donate in some of Zynga games, with 100% purchase price of these virtual items being donated to the fund. In Farmville, farmers can plant a limited edition daikon radish crops (white radish/Japanese radish) that will never wither. At 10 coins and 3XP per plot, this crops will be available for one week after donation. Donation amounts varies from 25 Farmville cash to 55 and 240. Crops will be ready in only 6 hours with 125 coins per plot. Café World: Players cans place Japanese inspired decorations in their Café to benefit the initiative. CityVille: Citizens can plant a limited edition sweet potato crop to feed their population and stock their restaurants. FrontierVille: Players can buy a limited edition Kobe cow to place in their frontier. Words With Friends: Players can donate directly by clicking on a Save the Children button inside the game. YoVille: Players can purchase homes and furniture inspired by Japanese architecture and design. Zynga Poker: Fans going for a royal flush can donate by purchasing access to a VIP table. 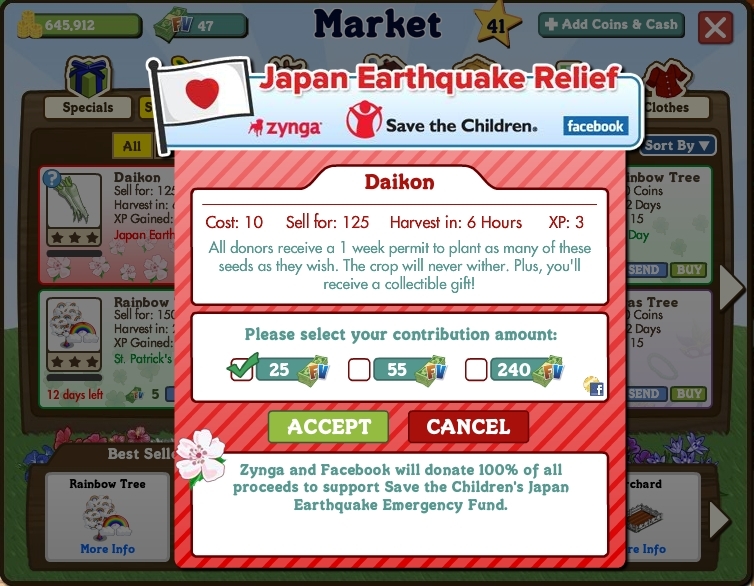 zBar: Players can donate directly by clicking on a Save the Children button inside the bar that sits across the top of their game on Facebook. OTHER WAYS TO HELP JAPAN? Digital ways to donate to Japan’s disaster. 7 ways to help earthquake and tsunami victims in Japan. This entry was posted in Facebook, Games, Info News and tagged Facebook, farmville, Games, Japan Donation, Japan Nuclear Disaster, Japan Tsunami, Japan's Earthquake, Zynga. Bookmark the permalink.